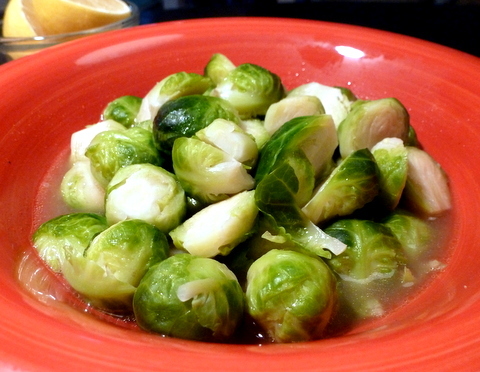 Place Brussels Sprouts in a medium sauce pan with vegetable broth, water, Braggs and Earth Balance. Bring the vegetable to a boil, cover with a lid, reduce heat and simmer for 4 minutes. Taste the Brussels Sprouts to see if they are done. If the sprouts are large, they may need to be cooked another minute or two. They should be al dente, or firm to the bite and bright green in color. When done, uncover the vegetable to prevent further cooking and baste with liquid, serve warm. A TIP: Cooking the sprouts until they are real soft can turn them bitter.